NEW YORK ( TheStreet) - Thanksgiving may be fresh in the memory, but with Christmas and New Year's Eve just a few weeks away, Americans will be on the move again. But the traffic jams, crowded airports, extra expenses and delays that often come with traveling during peak season do not have to cause frustration or stress. With all the travel apps available for the Apple ( AAPL - Get Report) iPhone 5, planning ahead and managing travel hiccups has never been so easy. "The on-the-go convenience of smartphones has facilitated their emergence as an essential companion for travelers," said Mark Donovan, comScore senior vice president of mobile, in a report on smartphone activity between December and February 2011. "We all know how hectic a travel experience can be, but smartphones have really stepped in to meet a variety of needs for travelers, such as coordination of schedules, locations, trip itineraries and transactions. With more than half of all smartphone users now engaging with travel content, there has never been a better opportunity for suppliers and OTAs (Online Travel Agents) to invest in their mobile strategies to provide a great experience and win loyalty from their customers." Stuck somewhere unexpectedly? Make the most of it with the last-minute travel app Hotel Tonight, which allows users to book hotel rooms across America, four cities in Canada and London, Dublin, Amsterdam, Birmingham, Edinburgh, Glasgow and Liverpool in Europe for up to a 70% discount. After selecting a city and neighborhood, users can browse some of the best hotels by viewing price, ratings, reviews and a slideshow images. Reservations made through this easy-to-navigate app are non-refundable. 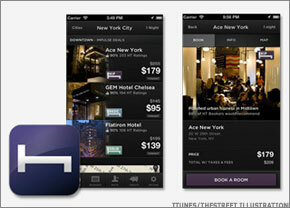 Because of the increasing competition for hotel booking apps, this free app offers discounts for first-time users. Hotel Tonight is compatible with iPhone, iPod touch, and iPad, but requires iOS 5.0 or later. It is optimized for iPhone 5. Data usage and roaming on smartphones can get expensive when traveling abroad, so this holiday season, stay connected with Skype WiFi. After registering with Skype by submitting credit card information, users can view the price of the nearest compatible Wi-Fi hotspot, connect and browse the Web, email, upload photos or tap into social networks. Charges apply to the minutes used, not the amount of data used. Users will be prompted to reconnect every 30 minutes. This free app is compatible with over 1 million Wi-Fi hotspots in hotels, airports, train stations, bars and restaurants around the world. But the compatible network is constantly expanding - in early October, Skype partnered with Wicoms to launch a Wi-Fi network, called Free Skype WiFi, for businesses in the UK and Ireland to purchase and offer free to their patrons. Skype WiFi is compatible with iPhone, iPod touch, and iPad, but requires iOS 4.3 or later. The XE Currency app, which offers a conversion tool for every world currency based on live currency rates, is a must for spending abroad. The app caters to a wide range of interests, offering over 30,000 currency charts for historic rates, as well as a straightforward calculator tool for converting prices. It also stores the last updated exchange rates, so users don't have to be connected to the Internet to view conversion. Users can adjust the currency symbols included in the comparison and pin the base currency to the top of the list. To reset the list, users simply shake their mobile Apple product. This free app is compatible with iPhone, iPod touch, and iPad, but requires iOS 4.3 or later. It is optimized for iPhone 5. Gone are the days of being stranded on an unfamiliar street corner in the rain - Uber allows users to order a private town car with a few clicks. Register with the app by creating a profile, inputting credit card details and selecting a pick-up location. Within minutes, a professional driver will arrive curbside. This user-friendly app sends a text to the passenger with the car's estimated arrival time and another when the car arrives. Passengers can also review a headshot and ratings of the driver. The service is reliable and particularly useful in cities or neighborhoods where cabs are hard to flag down on the street, but it's costly - a 40% to 100% premium on what customers normally pay for a taxi. At the final destination, passengers receive a receipt of the charge to their credit card via email. Airports by TravelNerd helps alleviate the stress of navigating airports. Users can select from 50 airports worldwide, to view 200 detailed terminal maps, Wi-Fi availability and pricing, airport restaurant, shop and lounge hours and locations, airport parking options (self-park, valet, 24-hour and covered), prices and locations, nursery locations and directions, as well as ground transportation options to popular destinations in the local area. But the app's benefits don't stop there. Its taxi-sharing feature helps users coordinate rides with other passengers to save money. This free app is compatible with iPhone, iPod touch, and iPad, but requires iOS 4. or later. It is optimized for iPhone 5.